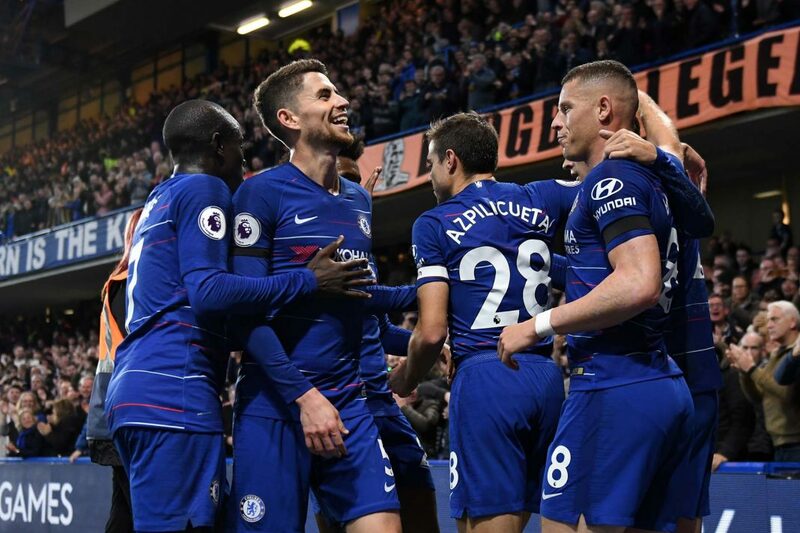 Alvaro Morata celebrates with teammates after scoring his team's first goal during the Premier League match between Chelsea FC and Crystal Palace at Stamford Bridge on November 4, 2018 in London, United Kingdom. In the News: Arsenal are just letting Ramsey go, which strikes me an singularly stupid. Either he and his agent have been making daft demands or they really are morons at the Emirates. We’re apparently so impressed with the form of Barkley and Loftus-Cheek in terms of our homegrown talent that were not interested anymore. I doubt we were in the first place. Speaking of Ruben, the Daily Fail’s Three Wise Men have been at it again. Redknapp: “So often I feel he is playing within himself at Chelsea.” Even if he had watched every second of RLC in action this season he has about three hours of football at most to have used to make this ridiculous, sweeping statement. And for ninety minutes of that he was scoring a hatrick. So he was hardly “within himself” then, was he? Bellend. More credible is the revelation that AC Milan are at their wits end with Bakayoko making silly errors. Sad to say it might be better if he makes another at the end of the season and gets lost on his way back to London. Dubravka has gone above and beyond. He managed to chop at his own leg with an axe. By accident. Also, Sp*rs fans were ATTACKED coming out of West Ham say the Press Plebs, ATTACKED. They then added in small writing that they happened to be in the home end. Idiots. Speaking of them. Some of the delay in their stadium construction work was allegedly caused by Levy having concrete taken up because West Ham supporting workmen had put a load of their memorabilia underneath it. Fortunately, he is apparently unaware of the dozen Chelsea flags that have been stuffed inside steel tubing at Wait Hart Lane. Salah now claims that ever since he was ten he always had a plan to end up with the Red Scouse. What a load of b*llocks. And Madrid still without a manager. Conte asked for three years and to come in with five people. Quite rightly after they saw him go batsh*t crazy after nine months with us they were dubious. The Others: Liverpool could only manage a draw with the Goons. Somehow amongst all of this vomit-inducing, sycophantic dross that is force fed down our throats about how this could be their year, the Red Swarm have failed to notice that for this to happen they will surely have to start beating their near rivals. Özil. Highest scoring German in Premier League history apparently. God the rest must have been sh*t. On his Wikipedia page the intro says: “Considered to be one of the best players in the world.” By who? His mum? Proof yet again of what happens when you give fools access to the internet. Leicester won their first game since the horrific events of last weekend. Schmeichel was in tears, Vardy says it’s like losing a member of his family. And not to be dissuaded by any of the grief and anguish on display at this incredibly difficult time, Lee Probert booked Gray for celebrating by removing his shirt to display a message for their deceased chairman on an undershirt. Jesus wept. I bet he’s the referee that doesn’t get asked out for a drink by the other referees. He’s not invited to their Christmas party. Which is surely a really f*cking low rung on the social ladder. Newcastle got their first victory in the league this season, while United made a meal out of beating a flying Bournemouth, who are not only halfway to avoiding relegation already, but are still ahead of Chequebook Pulis and his divas and only four points off the Champions League places. Hurrah. Palace’s turn to shuffle their pack. Didn’t make a lot of difference, though they were still trying. We had settled having gone two clear, easing off on the intensity somewhat. Fabregas came on with ten minutes to go. A bit of a rest for Jorginho. We’ll just have one of those perfect balls forward to Eden to hammer this home please Cesc. Refwatch: Oliver. Tolerable. I suppose. Which is more than can be said for most of them. We could have had a fourth on 83 but the ball went straight across the face of goal. Morata had wandered into an offside position so that was the end of that. He got caught a few times today, but I would rather he was chomping at the bit to shoot and on a hatrick than looking like wanted to dig a hole on the halfway line and climb in it. All the fight had gone out of Palace now, unless your name was Kovacic. They seemed to have a lot of energy left for kicking him. We almost gave away a stupid goal in injury time, but got away with it. Morata could have had a hatrick at the last. We broke, Eden handed it to him on a plate, and then instead of keeping it simple and going around Hennessy, who came tearing out, he made a mess of it when he tried to dink it over him. Sigh. If you like what you read here and want to chip in the odd gin to fuel my ranting or help with additional match tickets for cup games etc., please do consider dropping in on Patreon and becoming a blog patron. All of you are much appreciated.